Adams County Sheriff's Office is seeking information in locating this missing person. Last seen wearing light tan shorts, black tee shirt with "Chicago White Sox" and Chicago White Sox hat, gym shoes, and sunglasses, subject does repeat himself when he talks. 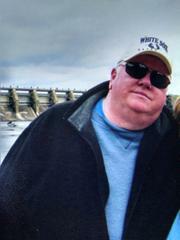 Willaim J Sheeran M/W 01/18/1958 5'10, 250 lbs, blonde hair, blue eyes. See Department Facebook page for photo.